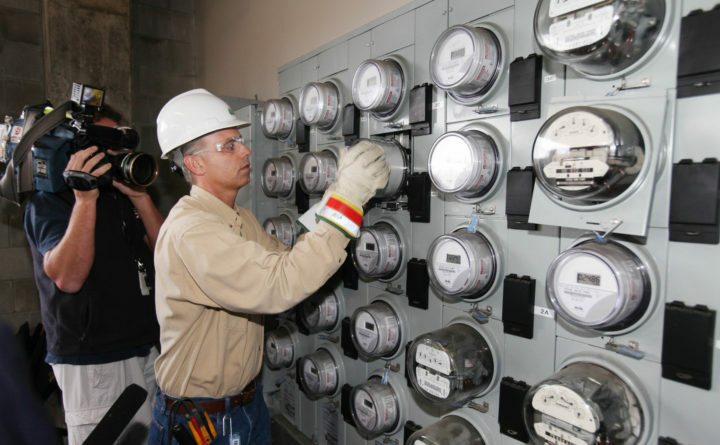 Central Maine Power technician Gary Sturgis installs a"smart" meter. On Wednesday Central Maine Power Company (CMP) took a public drubbing at the hands of state regulators who were upset over numerous botched billing practices. Now CMP has a new customer service snafu on its hands. The company recently told 62,000 residential customers they would get a bill credit, but they will not. This error began with an adjustment CMP needed to make for over-collecting money from large industrial energy users who pay for electricity. That was essentially the result of prepayments the companies made based on a formula set by regulators that overestimated what they owed. In time the overage rose above $3 million. Last year CMP won permission from state regulators to pay that overage back to the industrial customers via a January bill credit. The initial bills sent to those industrial customers included a message notifying them of the refund. The problem is that CMP included the same refund message at the bottom of bills that were sent to some 62,000 residential customers — customers who do not have such a credit coming. “We were told by Central Maine Power that this was a mistake. And that message only should have been sent to 122 large CMP customers,” says Harry Lanphear, a spokesperson for the Maine Public Utilities Commission. Hartnett says bills were sent out for two days before CMP caught the error. She notes that no one actually received an undue refund, so the company won’t have to try to recover credits that customers didn’t deserve. Hartnett also emphasized that it was human-error, not the company’s much-maligned new “SmartCare” billing system at fault. “Mistakes do happen, but there certainly should be oversight to make sure that they don’t, as much as possible, so we are certainly looking at where that could have gone wrong and how that could have been prevented,” Hartnett says. The Public Utilities Commission has two separate proceedings open to investigate CMP’s billing issues, most of which cropped up after it launched the new billing system in late 2017. One group of fed-up customers has taken the company to court over what they say are overcharges. Meanwhile, thousands of customers haven’t been properly entered into CMP’s billing system, and they are not receiving bills, or they are getting bills without charges, even though they have been using electricity. The issues resonate beyond the customers themselves. Vaughan Woodruff, who founded InSource Renewables, a solar-panel installation company, says he and company staff are burning precious business hours running interference for customers. “Rather than leave our customers with the whim of having to deal with the chaos of CMP’s customer service at this point, we end being the intermediary in that,” he says. Woodruff says frontline CMP staff are hardworking and competent, but he believes early retirements that CMP incentivized near the time the new billing system went live have been a factor in its struggles. CMP’s Hartnett says the company has added staff throughout its operations since then and is making substantial headway clearing up the billing backlog. She adds that the 62,000 customers who received the mistaken refund message will get a note in their next bills, telling them that it’s not the case.